WALKSTRONG ~ www.walkstrong.ca: " Cup Of Coffee ... "
I’m closing in on a year now since I had an actual cup of coffee ... yep, this former “Venti Non-Fat X-tra No-Foam Chai Latte” princess has been caffeine free. Well, that doesn’t include of course the coffee enemas, which is an integral part of the Gerson Therapy, and if you have visited me before you are aware of this. Those that are new, yes you read that right ... coffee enema AKA coffee break AKA upside down coffee. So why is coffee forbidden on GT? Well caffeine by mouth causes undesirable stimualtion of the digestive system. Orally taken caffeine overly excites the central nervous system (read below), while the essential oils disturb digestion. 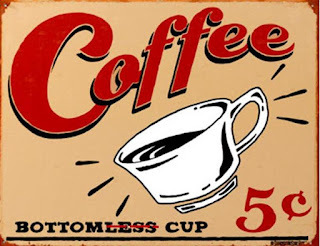 In contrast, when you take a coffee enema, it offers an entirely advantageous effect on the liver where, aside from detoxification, it increases the production of gluthathione S-transferase (a desirable enzyme) ... stimulating the liver to remove toxins from our bodies. Now do you really get that positive pep from your morning cuppa joe? ... from the research I’ve done, it seems that many of the positive effects of this “drug” become negative when the amount of caffeine consumed is increased, starting with a physical dependence. You see too much caffeine is associated with reduced coordination, insomnia, headaches, nervousness and dizziness. And when you go “cold turkey”, from my experience, you will experience withdrawal symptoms such as headache, fatigue and muscle pain. And here some more beans for thought ... caffeine works by competing with adenosine, a chemical produced by the brain. Normall adenosine binds receptors to slow down nerve cell activity, but caffeine takes it’s place ~ preventing it from doing its job at these locations in the brain. And the result? the activity of these nerve cells increase affecting our central nervous system, kidneys, muscles and cardiovascular system. Oh and if you think “decaf” is better, think again ... there is still residual caffeine in the coffee and it starts working as soon as 15 minutes after consumption ... taking ~ 6 hours for half of the total caffeine consumed to be eliminated from the body. So my choice of drug ... my upside down coffees. And if you are interested in finding out more, check out The Wellness Warrior’s how to do a coffee enema here ... Bottoms Up! !